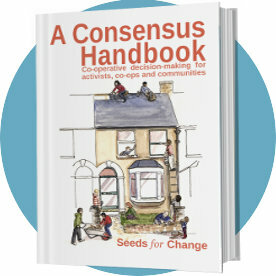 Seeds for Change sprung up in 2000 out of a need to share skills for effective organising across groups campaigning for an ecologically sustainable and socially just world. By 2001 we had incorporated as a worker's co-operative and started receiving funding for our work. In 2004 we joined together with Tools for Resistance and formed two collectives based in Lancaster and Oxford, both working under the banner of Seeds for Change. Together we have worked with hundreds of groups, run dozens of trainings for trainers, organised workshop programmes for many large events and written over 40 guides to effective campaigning and co-operation. We've provided training for groups involved in a wide range of campaigns: from fighting road building projects, stopping GM crops, resisting coal mining and organising against fracking to fighting for community renewables and no borders. We've also supported organisations creating alternatives to the exploitative system we live in, such as housing and workers' co-operatives, community growing projects and social centres. Along with other grassroots training collectives such as Tripod, London Roots and Turning the Tide, we are part of a well connected wider network, sharing skills and working together. Over the years our membership has varied and our organisation and collective knowledge has been enriched with each person who has been part of our network. Some of us have gone on to start the brilliant Rhizome training collective. Others have become authors about grassroots utopias, check out maxhertzberg.co.uk.